Come and try a ‘Trial Ride’ with us! The Club welcomes potential new members to come on a few ‘Trial Rides’ to see if ‘The Club’ and our activities are suited to them, we're not naive enough to think we can cater for all needs and if after a few rides you decide it is not for you then that is not a problem. We would suggest that for a first ride you meet up with us on a Saturday, we meet at Americarlo’s in Farnborough Village and arrange to leave at 10:00am for a shortish ride of no more than 30 miles, this is broken at the half way point for a coffee etc at one of our normal stops before coming back to Farnborough for 12ish. This is a very gentle ride and should be relatively easy to complete. 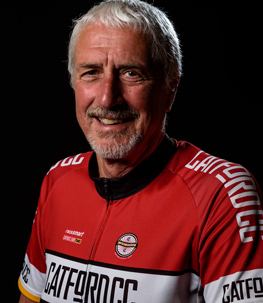 You can join in this ride in one of two ways; either ring Peter Pembery our club Captain and ask for any info you need like clothes/kit/bike etc or just turn up at Americarlo’s and introduce yourself and ask to come on one of our organised rides. The only thing we need to point out is that ‘our insurance’ only allows for someone to come on three test rides to make their mind up, after that you will have to decide if you wish to join the club or further riding with us would negate our insurance, so we hope by then we have done enough to convince you of the merits of joining the club!